Harman-Kardon Go+Play Wireless review | What Hi-Fi? Harman/Kardon's Go+Play docks haven't changed an awful lot over the years – but then why would they, when they look like this? Getting it up by your head would be easy too, thanks to the big stainless steel handle that curves sumptuously down to the base and doubles as two of the unit's four rubber-bottomed feet. But the weight could still be a problem: like the boomboxes of old, the 4.3kg Go+Play Wireless uses eight massive D-cell batteries (go rechargeable or be prepared to take a serious hit to the wallet). The dock's bug-eyed look is down to its driver complement. Behind each grille on the front is a woofer and tweeter array (each unit has a dedicated power amp – 30 watts for bass and 15 watts for the highs), and round the back two identical grilles cover a port and… well, nothing that we can gather. It seems to be there just for show – but it does look nice. Elsewhere on the rear panel are the power socket, a 3.5mm input and a USB socket (for charging only), which are concealed behind rubber lids that should provide a little bit of waterproofing should you use the Go+Play Wireless outside. The battery cover, however, doesn't have any seals – so try not to get the bottom wet. Shift your attention to the Go+Play Wireless's top panel and it's a similarly stripped-down affair, with only an on/off/source-select button and volume controls on the non-slip rubberised surface (somewhere to rest your portable while it’s charging). And that's it as far as physical features go. It's a nice thing to look at, this dock, and we're glad that Harman/Kardon hasn't overcomplicated it by adding too many buttons. Pairing your device is easy enough. The Go+Play automatically puts itself in pairing mode the first time you power it up, so all you have to do is select it on your Bluetooth device. You’re also prompted to install the free Harman/Kardon Play app, and are taken straight to the Apple App Store to download it. It’s a nice touch. The app is essentially a replacement front-end for your Apple device’s Music app. It provides access to all your individual tracks, playlists and so on, and also lets you set up custom playlists on the fly. It works well enough and is nice to look at (even creating its own basic album art for tracks that don’t have any), but we’d question whether it’s better than Apple’s own version. Still, it’s nice to have the choice. We gave the Go+Play Wireless a whirl before running in, and were pretty happy from the get-go. It’s quite an agreeable listen with only a little boxiness at the bottom of the midrange, and a touch of uptight hardness to the treble as minus points. The low frequencies are pretty pronounced, though – and while they don’t thunder and boom like Brian Blessed in a shipping container, they are a little overdone. Dynamics are decent, though, and exhibit a fairly agile and articulate way with vocals and treble information such as cymbals and snare-fizzes. After a good 24 hours of playing Bon Jovi to a darkened, uncaring listening room, though, things had loosened up considerably. Those hard edges in the treble diminish (although they don’t disappear completely), and the upper reaches of the frequency range get far sweeter and more compliant when it comes to delivering detail. Overall, it’s a more open, easygoing sound. The Go+Play doesn’t deliver the last word in precision, though – and that’s largely down to the fact that its bass performance is still on the exuberant side. It seems to slow down the dock’s dynamic response which, while good, does leave a little to be desired. This doesn’t do complicated recordings any favours – they get a little confused. It’s a hefty sound, then, but it does lack that last bit of punch that would make it truly exciting. However, it is pleasantly easygoing, and won’t grate over long listening periods. Switch to the 3.5mm auxiliary connection and, predictably, there’s an improvement across the board. The iPhone is renowned for having an excellent headphone output, and Bluetooth is likewise renowned for sapping audio of a touch of pizzazz, so we aren’t surprised. The level of refinement increases, and you get an overall tighter, more composed sound with greater cohesion across the whole frequency range – and a greater sense of solidity as a result. It’s punchier, too. That slight squidginess we got over the Bluetooth connection is mitigated and the excitement level increases, especially in the midrange. But, again, the bass is on the lugubrious side. 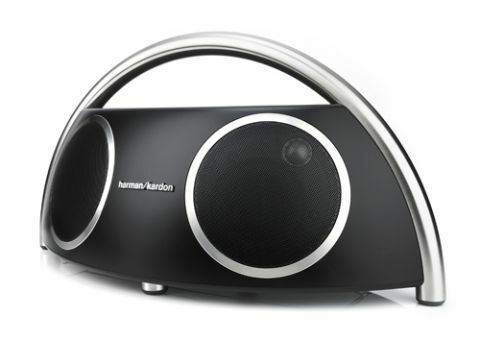 So, it’s got to be four stars for the Harman/Kardon Go+Play Wireless. We certainly can’t fault its looks, or its ability to shake a room with the amount of volume it offers. But that sonic heft also takes the shine off an agile, detailed treble and midrange performance in the shape of slightly overblown bass. It’s close, this dock – so close – to five stars. But not quite there.